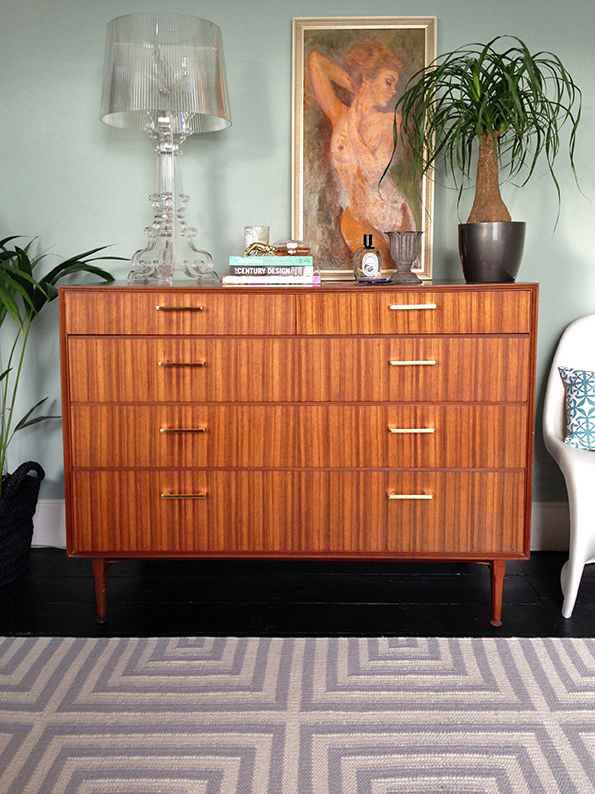 I bought a vintage chest of drawers for our bedroom on ebay recently, which turned out to look an awful lot better in the photos than they did in reality. That's ebay though - it's always a bit of a gamble if you're buying vintage, or anything for that matter, that you've not seen in the flesh. I probably couldn't accuse the seller of mis-selling exactly, more of using flattering photography / lighting / angles, and a vague description. 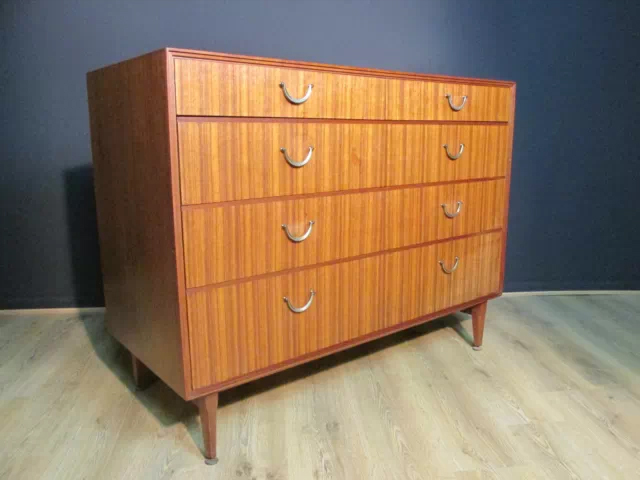 When it was delivered, I saw that the fronts of the drawers were covered in what I think were watermarks, the drawer fronts were also very faded - and they generally looked old and grotty, as opposed to the old and a little bit glam I was expecting. I wasn't super disappointed though, as it had great bones and was the perfect size for the space - I wanted the largest chest of drawers I could fit along the wall to maximise storage space, and this is 122cms wide by 95cms high and 55cms deep - a sizeable piece, so was by no means a complete disaster of a purchase as it's flaws were only skin deep. 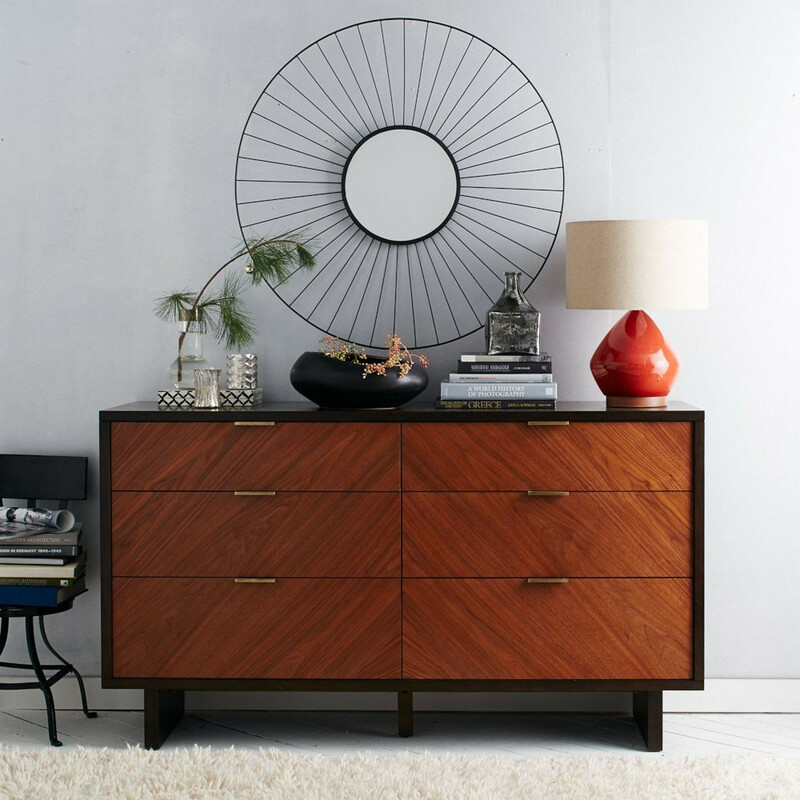 I had really wanted a new piece to fit the space in our bedroom, albeit a new piece in a mid century style, like this chevron grained beauty from West Elm. I really, really wanted it. In fact, I still do. Sadly though, even with a big price reduction when it was on sale (£949 reduced to £549.95), it was still way above what I could afford to spend, so I had to let it go (let it go..!). Not bad for £120 huh? But this was the reality... Hmmmm, not quite so pretty now, is it? You can see from the dust in the image above that I'd already started taking to it with sandpaper. Impatient as ever, and a bit of a risky move considering that it's veneer, but thankfully, good quality thick wood veneer, so it's taken a sand perfectly well, and all the marks have come off. 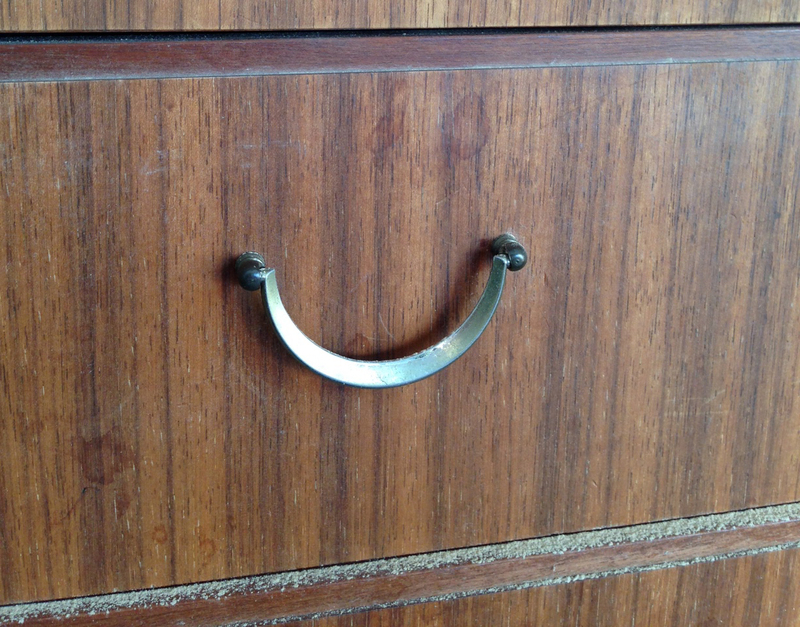 You can also see in the image above that the handles were not in good condition at all. They were probably once lovely shiny brass, but that plating was long gone, and no amount of elbow grease was going to make them sparkle again. I looked into having them re-plated, but it was surprisingly more expensive than I'd thought it would be at around £13 a piece, so a total of £104 for the eight handles - nearly as much as the chest of drawer cost to start with, and I just didn't like them enough to spend that kind of money, so I started the hunt for some replacements. The replacements had to fit or cover the existing holes, which meant my choice was quite limited, in an already limited market. However, I absolutely love the ones I found. I have a post dedicated to cabinet hardware coming very soon, so you'll have to wait for the details, but they were £6.30 each. I'd possibly have preferred a natural brushed brass if it was an option, but I do love their shiny goodness. I removed the old handles, and sanded to get rid of the uneven faded varnish and watermarks, and filled the existing handle holes with a drill-able filler, as the new holes needed to be precariously close to the old ones. I drilled new holes, and gave each drawer three coats of clear Osmo Oil, before fitting the new shiny new chunky handles... Ta dah! I'm pretty proud of this one, even though it was very straight forward, because it's made such a dramatic difference, and taken a battered and really average piece of furniture, to something I love and will keep for years to come. Not to mention the fact that we can finally put all our clothes away. Now remember kids, the moral of this story is that you should probably ask more questions than I tend to when buying vintage on ebay, and perhaps for more closeup shots too. Or just take the gamble, which is quite probably half the fun. A very good job!! I really like the new look, I am after a dining table myself, but my budget is 0.00000 so I would have to be creative, unfortunalty I seems to have a very expensive taste. I'm totally impressed. The end result is actually nicer than your coveted West Elm piece. 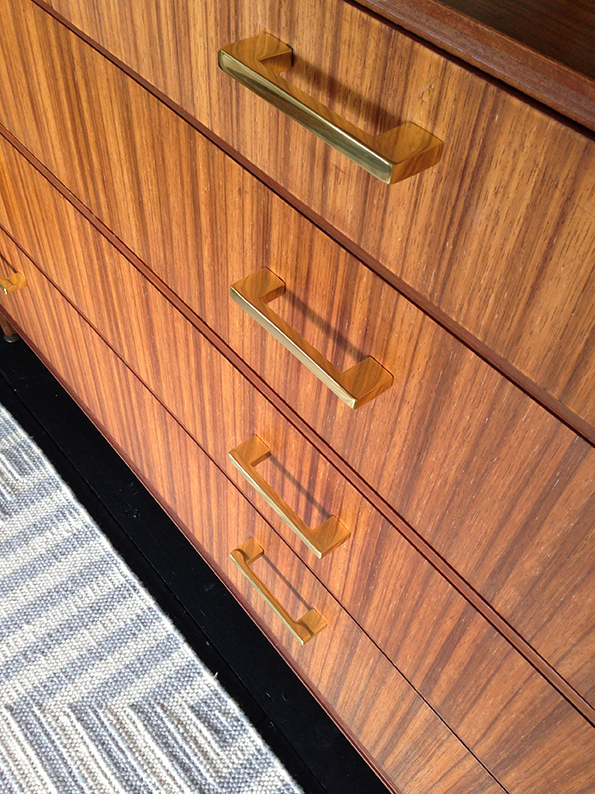 Love the tiered sizes of the drawers !